With the access to social media, decorations for weddings and/or parties have exploded! The options and choices are endless and they are more easily accessed by the public through on line ordering as well as even overseas options. This has almost created a need for each bride to feel the stress of making her wedding and big or as beautiful and those of her friends or family members. There are still ways to make your personal wedding or event as big and memorable without spending a fortune. One thing that is coming back onto the scene is balloons. 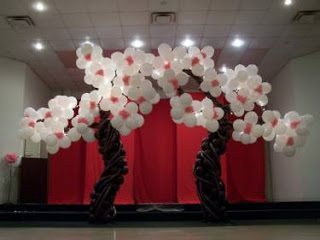 Balloon artists are beginning to use them in new ways, create new art with them and brides are beginning to use them in their weddings again. Take a look at the cherry blossom tree above, found on Pinterest. It is amazing that those are balloons but what a conversation piece if a couple used these either for the back drop of their wedding vows or as a picture spot for guests. Remember to think outside the box when planning your next event and “Wow” your guests with a new and creative form of decoration as well! Have fun with it! Good Luck!